Most of us are so used to the way our homes look that we don’t give it much thought, but if you are planning to sell, great curb appeal can make the sale faster, easier and many times, more lucrative as well. Take a minute to walk across the street and give your house a good look. If what you see is less than stellar, don’t worry, there are inexpensive ways to dress up your house for a quick sale! Rather than run out to the nearest garden center and buy a flat of flowers, take some time to determine what will make the most sense and still keep you within budget. What plants do you already have? Perhaps you simply need to prune trees, shape bushes, pull weeds and get that lawn back to green! As unfair as it may sound, an unkempt yard can lead a prospective buyer to believe that the house may have deferred issues as well. If you feel your garden is a little bare and could use an extra punch, make sure that the plants you choose will thrive in the areas you intend to plant them. If you are planting in a shady spot, stick with shade plants. It may sound obvious but unless a plant is labeled ‘full sun’ many plants simply can’t take the heat and your work and dollars will go down the tubes in a heartbeat! Do a little online research or even stop by a local garden center and ask for advice. If you live in a condo or have little or no space for a garden, you can add a couple of big pots with colorful plants on either side of your door. They will brighten your doorway and create a welcoming entrance for visitors. 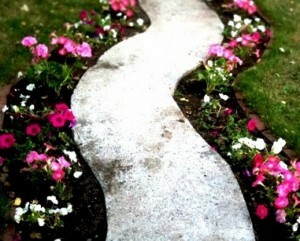 How Does the Walkway Look? Replace missing and broken pavers. If you have space, you can put a row of bricks along the edge or plant bright season blooms along the edge to create interest and draw the eye towards the front door. Speaking of doors, a fresh coat of paint on just the front door can make a huge difference in the way your home appears. I have clients who have already told me the first thing they are going to do when they buy a house is paint the front door red! Red may not be your thing, but a bright or contrasting color will definitely add interest and is an inexpensive ‘fix’. Add a nice, new welcome mat and you are good to go. Agreed, the backyard has nothing to do with curb appeal, but as long as your are working the garden you might as well put some energy in the backyard as well. In Los Angeles, most people think of the backyards as an extension of their living space. If you have the space and don’t already have one, plant a citrus tree. The Meyer Lemon is a favorite and they grow pretty quickly. 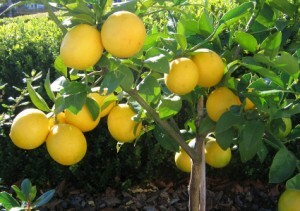 I can’t imagine living in L.A. without a lemon tree- it’s almost a requirement! A small tree will grow pretty quickly and won’t cost a whole lot. It will definitely be worth the investment. For more ideas on getting your Silver Lake home ready to sell, simply give me a call at 213-215-4758. I can stop by and give you my objective opinion on what small changes you can make to the outside of your home to get that first impression you are hoping for!